The six-month-old joey, born to mum Alinga in July, was spotted at Edinburgh Zoo. 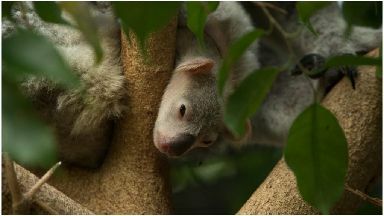 A six-month-old koala joey has peeked out of its mother's pouch for the first time at Edinburgh Zoo. 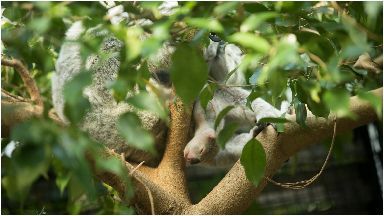 The sleepy-looking Queensland koala was born in July to mum Alinga and will take another month or two to grow big enough to move onto her back. Koala joeys are the size of a jelly bean when born and spend the first six or seven months of their lives within their mother's pouch where they grow and develop in preparation for life outside. After outgrowing the pouch, joeys spend around 12 months on their mother's back before becoming more independent. There is only one species of koala but there are distinct regional differences depending on which area of Australia they are found - the further south you go, the larger and hairier the koalas become. As well as being members of a worldwide koala breeding programme, The Royal Zoological Society of Scotland also support conservation projects in Australia that help to rehabilitate sick and injured koalas and release them back into the wild. Opening hours at the Koala Territory at the zoo may vary as the new joey settles in.